Further to a thorough timber pest inspection of your property there are preventative as well as eradication procedures that can be carried out to help lower the vulnerability of the structure of termite attack. The treatment for termites depends on a number of factors, including how your home is constructed, the type of termites found. 1. Installing an Exterra monitoring, baiting & colony elimination system. 2. Applying a continuous subterranean termite “treated zone” around the structure using Termidor. 3. Pre-Construction/Renovation Physical Barriers including HomeGuard. Southpest can tailor a package to suit your home. 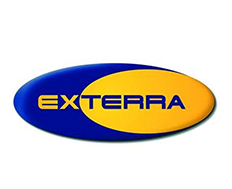 The EXTERRA Termite Interception and Baiting System is there to protect you from the invasion of termites, continually. EXTERRA Stations are placed around your property to intercept termites. Once intercepted, REQUIEM™ Termite Bait is added to the large EXTERRA Station. The termites feed on the REQUIEM and the colony is eliminated from baiting at the point of termite attack. Click here to view Exterra brochure. Treatments and methods vary with each home. For the last forty years pest managers have used chemicals to create barriers in the soil to prevent termites attacking buildings. Although some of these products kill individual termites which come into contact with them and some are repellent, termites will persevere in an attempt to find a path through or around the barriers. Newer, non-repellent, liquid compounds are a modern method of termite control which offers an alternative to the repellent barrier concept. These compounds offer a lower toxicity, no odour formulation which creates a “Treated Zone”. Termite workers which enter the “Treated Zone” become disorientated and cease feeding and grooming. They are killed either by the insecticidal action or, at low exposure levels, succumb to the action of soil fungi. Worker numbers are reduced making it harder for the termites to find a way into the structure. Termite barriers or “treated zones” make it easier to detect termites during regular inspections by forcing termites to show themselves. A termite may build a mud tunnel up a sub-floor wall or brick pier and upon reaching the termite barrier can build the tunnel around the barrier to reach the timber above. A clear view of walls and piers and easy access to the sub-floor area means that detection should be fairly easy. However many styles of construction do not lend themselves to ready detection of termites. The design of some properties is such that they make the detection by a pest inspector difficult, if not impossible. The termiticides Biflex & Termidor attach to soil particles and cannot be leached away by rainfall of watering of lawns and gardens under normal circumstances. Each is also environmentally friendly and is not harmful to humans or pets including soil microorganisms and plants. Designed to repel termites, but will also kill termites that come in contact with the product. 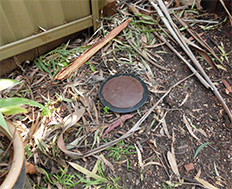 Life of termiticide – External perimeter up to 5 years. Designed to kill termites and affect the colony. Termites cannot detect the termticide and randomly forage through the treated zone where they pick up a lethal dose. 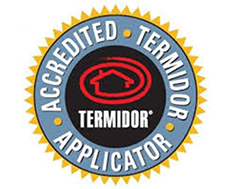 Termidor is then transferred through normal feeding and grooming to other termites, which has the capacity to eliminate the whole colony. Life of termiticide – 5 to 8 years. Insurance against Termite Damage – Most household insurance policies do not cover structural damage that termites cause. Timbersecure offers protection with an insurance policy that will cover all structural & decorative timber repairs or replacement to the value of $100,000.00*. Click here for the brochure, *conditions apply. Call Southpest on 02 9545 5700.